Thank you for signing up and participating in the 2019 Fish Fry! Volunteer Check-in is on the upper level in the Holy Family Room by the fireplace. Fish Fry volunteers will be discounted 1/2 off their fish dinner based on the shift(s) of the current fish fry. Volunteer meal tickets may be purchased before or after Volunteer Check-in at one of the Ticket Sale Tables. Volunteers should wear their RED Guardian Angels Fish Fry T-shirt. If this is your first time volunteering at the fish fry, we will have extra red GA fish fry shirts at Volunteer check-in for you. 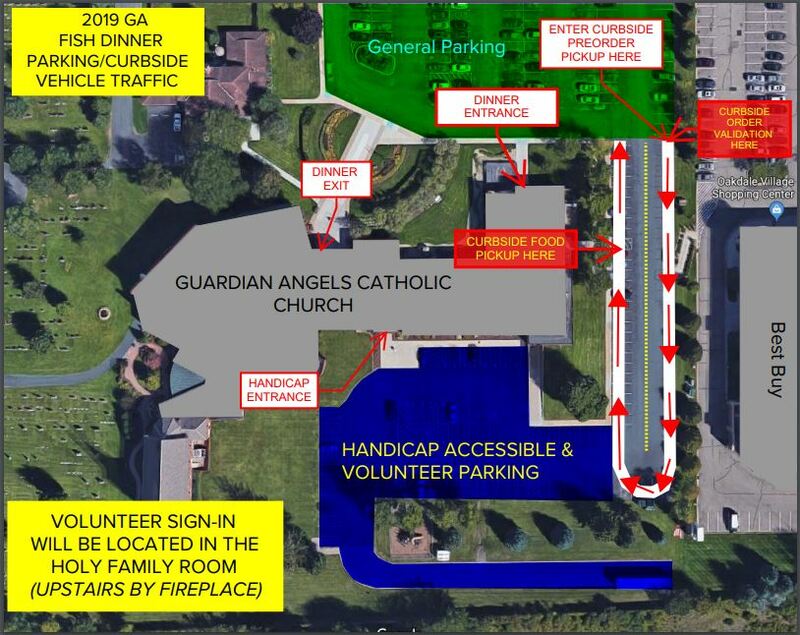 Click here to see 2019 Guardian Angels Fish Dinner Parking/Curbside vehicle traffic flow and parking map. Nursery will be available by R.S.V.P. for the GA 2019 Fish Fry workers/volunteers only from 5-8 PM on March 15th, 29th and April 12th. Please book Fish Fry Nursery drop off indicating dates and number of children with Sara Fleetham at 651-789-3179 or sfleetham@guardian-angels.org.